Our Slimming Apple Cider Vinegar Activator - helps to stimulate the metabolism - and get a flatter tummy in just five days! Has to be the best natural weight loss supplements for women, that can help you lose up to 11 lbs in 7-8 days! A great way to detox your body and feel the results immediately! thereby promoting a feeling of well-being. Apple Cider Vinegar Activator contains cholesterol-reducing pectin and the perfect balance of 19 minerals, including chlorine, sodium, magnesium, calcium, sulfur,, phosphorus, iron, fluorine, potassium and silicon. In fact, apple cider vinegar activator contains 93 different components that can help your body; it is also often used in colon and intestinal cleansing formulas. and has been boosted with higher levels of chromium, zinc and sea plant extract. 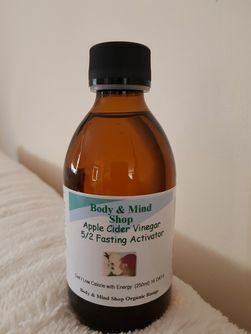 This Traditional Devon Apple Cider Vinegar Activator has been created and selected from the very best apple cider vinegar base, used for its natural special cleansing and slimming effect. These very natural healing properties containing a natural ability to dissolve fat, have been enhanced and boosted with chromium and zinc to help you lose weight quickly by promoting a normal way of eating. It improves the function and adjustment of the body so that efficient use is made of the food you eat so you become very satisfied and content with the right amount of food. In Louis Woolf's 'Organic Secrets from the Temple', the Secrets of Slimming Apple Cider Vinegar Activator (nature's 'Ultra Burner') are revealed. Use Apple Cider Vinegar Activator to help you shape up in combination with a 'Lifestyle' change: FREE Naturopathic healthy eating guidelines, including our Hollywood flush, detox and weight loss cleanse plus a few exercises. To keep your body on a naturally increasing cycle of weight loss, we also recommend that you take Pico B6 Metabolism Support, a thermasleep night time supplement. Louis Woolf explains how the Apple Cider Activator works: our ‘Body and Mind Shop’ specially-boosted 10 year old Devon 'Scrumpy' Cider Vinegar Activator frees up all the spare fat, preventing it from building up. This stimulating role, preventing the creation of new fat cells, also 'opens up' all the existing fat cells and directs the surplus fat to your muscles, ensuring it gets burned off the natural way, helping you to lose weight from your stomach, bottom, hips and thighs in record time. Directions: Start by sipping two teaspoonfuls of slimming apple cider vinegar activator in a tumbler of cold or lukewarm water. Have it ready by the side of your bed, then sip a tumbler of water containing the two teaspoonfuls of slimming apple cider vinegar activator during three of the main meals of the day - breakfast, lunch and dinner. Try to make your drink last through the whole meal. If you cut out any meal, have the slimming apple cider vinegar plus the green ‘powerful action slimming tablets’ instead. Also chew your meal to thoroughly enjoy it: this will give the Body & Mind Shop Cider Vinegar Activator the greatest chance to act. Finally, don’t rush it - don't lose weight too fast! Achieving the right weight is a wonderful thing to do. Be happy whilst you slim. Directions for Arthritis and Rheumatism: Two teaspoonfuls of Apple Cider Vinegar Activator and two of honey in a glass of water, taken at each meal (or between meals). For maximum effect take with the green ‘Body & Mind Shop powerful action tablets’. Avoid wheat foods and cereals, white sugar, orange juice, muscle meats (such as beef, lamb and pork), as these products produce an adverse reaction. For best results please follow our dietary guidelines and supplement programme. Apple cider vinegar activator one of the best natural weight loss supplements for women can be used with Mexican Wild Yam cream see under womens health: Body and Mind Shop PMS Cream to counter act oestrogen dominance that may be one of the reasons you are finding it difficult to lose weight. This winning combination canmake all the difference and should be considered after the age of 37 to restore hormone balance naturally. Naturopath Louis Woolf recommends this regime for rheumatoid arthritis, osteo-arthritis, bursitis, general joint pain, gout and stiffness, and among the best natural weight loss supplements for women. Each Body and Mind Shop bottle is made from organic apples containing a healthy dose of pectin. As pectin works its way through the digestive system, it binds to cholesterol, then pectin pulls the cholesterol which is bound to it out of the body. Less cholesterol in the body reduces your risk of cardiovascular problems, such as heart attacks and strokes. This amazing natural product supplies you with a natural slimming programme and helps your cardiovascular system at the same time. This will save you money on your shopping bill by helping to ensure that you are getting the maximum nutrients in a minimum volume. No more excess food consumption, as well as helping to improve your health and getting you into shape! This wonder product will help you to lose weight by opening the existing fat cell deposits in your midriff, hips, legs, behind and thighs in a relatively short period of time, sending fat to the muscles where it is burned off as energy. The Apple Cider Vinegar Activator's natural ability to dissolve fat has been enhanced and boosted with chromium and zinc to help you lose weight quickly by promoting a normal way of eating. It improves the function and adjustment of the body so that efficient use is made of the food you eat - so you become very satisfied and content with the right amount of food, enabling you to Slim Organically and de-tox for around £1.00 per day and save you money! (Apple Cider Vinegar Activator - For extra convenience when yur travelling). on our list of products below at the bottom of the page "We also recomend"